(Newser) – Where Voltaire, Alexandre Dumas, and the team behind 1998's The Man in the Iron Mask failed, Paul Sonnino says he has succeeded. The history professor at UC Santa Barbara claims to have uncovered the true identity of the masked man who, starting in 1669, spent more than 30 years imprisoned in France's Bastille and other jails, Live Science reports. More importantly, Sonnino's new book, The Search for the Man in the Iron Mask: A Historical Detective Story, proposes a theory for why the mystery man was incarcerated in the first place. 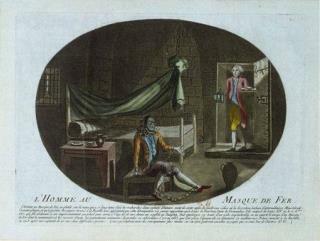 Sonnino tells the UC Santa Barbara Current that historians already largely agreed that the man's name was Eustache Dauger, and that he was a valet, rather than the twin of King Louis XIV, as Voltaire and Dumas claimed (and the mask, worn only occasionally, was velvet, not iron). But the trail went cold after that. Dauger (or Danger) is by far the most logical choice for historians about one century, and already identified as a valet, no great news about that. Royal births took place in public, which means the hypothesis of a twin brother didn't seriously exist, except in the minds of a opponent to absolute monachy such as Voltaire, or to a novelist like Alexandre Dumas. As for the iron mask, it wasn't made of iron, but of velvet. French convicts condemned by the King's royal personal justice, if secret, had to disappear from the face of the earth, no one should know if they sill alive. They had to carry such a mask in order not to be recognised when taking a walk in the prison. No need to invent a history of a deeply scandalous resemblance or the taking of an wounded alien to explain that. The rest is ill recollections, desire of making oneself important thanks to his stories, and the genius of Dumas. If the mask was velvet and worn occasionally, then no one really cares who it was, I suppose. We have a winner. So, what prize does he get? Ah, yes, I'm quite familiar with the game. At the next dinner where this blowhole is invited, he's going to monopolize conversation at whatever table he sits. "I'm the one who solved the great mystery of the iron mask." The other people then ask, "And then what else did you do?"